The "Hotel Gondolier", as it is called in this postcard image, is seen on the banks of Town Lake, in downtown Austin, Texas. The description on the back refers to it as "The Gondolier Motor Hotel" located at Interstate 35 South and Riverside Drive. I have no idea when this postcard was printed, although it was probably circulated before ZIP codes were made mandatory, as the address information on the back does not include a ZIP code. After a brief internet search, I find no current hotel by that name in Austin, Texas, although I did find the building - still standing (thanks Google Earth!). The shoreline in the postcard looks to have some sort of pedal-boats or row-boats lined up. ...And then there's the gondola. I'm not quite sure what kind of gondola it is, but it's clear that the folks who produced this postcard, decided that they needed to have a gondola in the shot. In my opinion, it looks like someone made a few drastic modifications to a row-boat, giving it rather tall stems both fore and aft. This gives the boat an almost cartoon-like apearance. Hey, I'm not here to judge, I've got a few boats that I'm sure would be worthy of ridicule in the eyes of more tradition-minded gondola experts. I actually enjoy images like this because they foster such curiosity and contemplation. A Venice-built gondola in the photo would cause me to observe that...there was a Venice-built gondola in the photo. Oooh, very exciting. But this boat makes you wonder: "what the heck kind of gondola is that?" it makes you want to hunt down the old hull just to get a look at it, just to see for yourself that it really exists. Oh, and just to clarify, I'm pretty sure that this postcard was produced long before photoshop and other computer-aided methods existed. 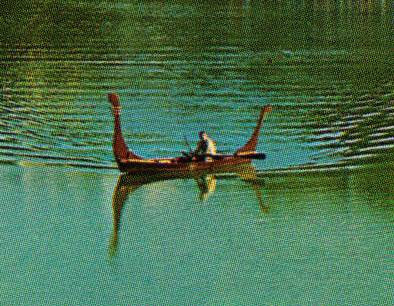 Whatever it was, this "gondola" wasn't the only one ever to grace the waters of Austin's Town Lake. Paul Parma holds the honor of being the only one we know of to place Venice-built gondolas on the water there. He brought two real beauties there about eight years ago. Have any of you ever heard of the Hotel Gondolier? Hey gang. 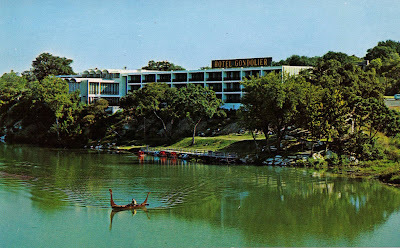 This is Paul Parma and I thought I would add some filler to the post Greg made regarding "The Gondolier", called “Austin's new lakeside motel” in the grand opening flyers (in '63 I believe). I had interviewed Roberta Crenshaw for background info on the hotel's history. She was in her mid eighties then (2000), and had been an owner of the hotel. I had been hearing that they had some gondolas on the lake as a service affiliated with the hotel but no one could produce a photo, and we all know how gondolas tend to get photographed so I had my doubts. Roberta, step mom to golfer Ben Crenshaw, told me that as she remembered it, she had purchased two gondolas during a trip to Venice. She said she recalled that they burnt while still in a warehouse in east Houston, waiting for the hotel dock facilities to be completed in Austin. She didn't trust her memory in her eighties, but her skepticism and her sharpness during the interview leads me to believe her with no real evidence otherwise. She showed me a brass horse from a gondola, acting as a lawn ornament in her lawn, that had been sent ahead of the gondolas to Austin. Roberta has been a driving force in the development of Austin's Town Lake. BTW it is now officially called "Lady Bird Lake" now that Lady Bird Johnson has died. But Lady Bird herself has admitted that when she began her contribution's to Town Lake she was "jumping on a moving train". Robert was the loudest and most powerful engine on that train until Lady Bird (and her powerful name and connections) got on board. Roberta had became rich through a string of prosperous marriages. Her first was to the wealthy Malcolm Reed, several decades her senior; a scandalous situation that Roberta credits as an impetuous to her subsequent focus on community service - a guilt reflex she says. Roberta died in 2005. So my best guess is that yeh, my gondolas were the first in Austin, but without proof it only a guess. I’m thinking that the photo that Greg came across is what is making some think that gondolas really were on Town Lake; maybe the atrocity made a few appearances. I do row Venetian style often on Town Lake ( I'm sorry, Lady Bird Lake) in my aluminum Jon boat. That may be a first on this earth, Venetian rowing in a Jon boat, though its hardly much to brag about if true. Thanks for the details on both the lake and the hotel. I think you're correct - a photo like that could easily lead people to believe there were gondolas operating there on the lake. Hey, when you row that John Boat, is it single-oar or a la Valesana? HEY THERE, THIS IS VERONICA FROM AUSTIN TEXAS, BORN AND RAISED. I WOULD LIKE TO AD IF ANY ONE IS INTRESTED I HAVE A POSTCARD OF THE GONDOLIER MOTOR HOTEL. IT HAS TO BE PRINTED SOMETIME AFTER 1957, THIS SHOT IS FROM THE FRONT OF THE HOTEL WITH MOSTLY 57 CHEVYS PARKED IN THE PARKING LOT. AND IT LOOKS LIKE THE CAPITAL AND THE CLOCK TOWER OF UNIVERSITY OF TEXAS ARE THE TALLEST BUILDINGS. OH BY THE WAY DOWNTOWN VIEW IS IN THE BACK ROUND OF THE MOTOR HOTEL. Yes, I'd love to see that. Do you know anything about gondolas or other boats associated with the hotel? My name is Pam. I know alot about the Gondolier Hotel...it is a part of me. My grandfather opened the hotel on September 20, 1962 at the corner of Riverside and IH 35. The man in the gondola is my father. The original gondola's from Italy caught fire in the engine room before the hotel opened. I still have the brass horses that were on the end of the gondolas, as well as old 8mm film of the hotel being built. I was a freshman at UT in the Fall of '58, and I'm CERTAIN the Gondolier was open and operating then. I went to a couple of fraternity deals there. And there were gondolas operating there, apparently ferrying guests from one side of the lake to the other. My older brother had his wedding reception there. Easier to remember than the eatery on South Congress where my folks (and my brother's new in-laws) convened later on that evening to compare notes on child-rearing.